The ideas that were shared with us at this year’s TEDxDetroit weren’t only insightful, they were progressive. Simply put, we were awe-inspired as some of Detroit’s best thinkers graced the stage to share their loving ideas of growth, freedom, health, prosperity, technology, art, education and more. 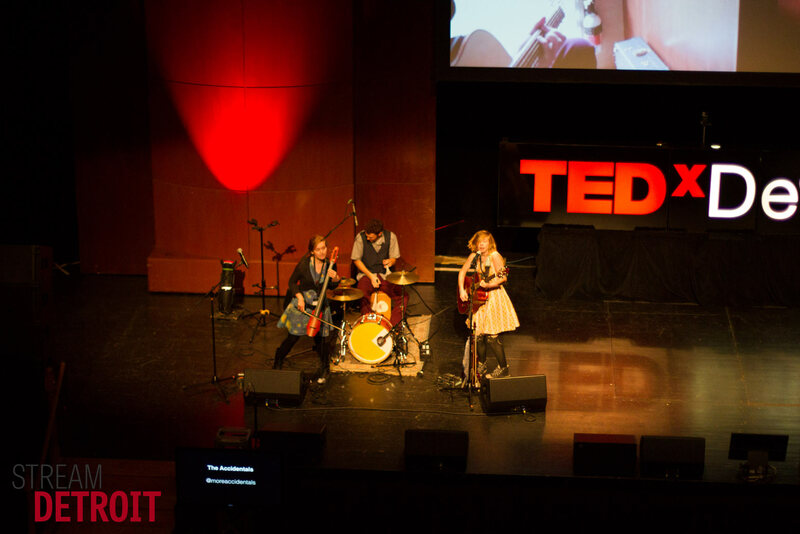 Pictured are The Accidentals, a band that stunned the TEDxDetroit audience. On Tuesday, September 30th, 2014, we learned that technology is limited by our decisions (also by the advancements made in batteries), that people in our community are working to overcome some of today’s issues (like growing a sustainable food system, urban civilian mobility and even credit card fraud), and that we shouldn’t settle for anything less than fulfilling our dreams. As progressive as TEDxDetroit may have been, there are still those who weren’t at the event, those who didn’t realize that the event was going on, and those who’ve never even heard of TEDx or even Ted Talks before. So we at Stream Detroit are setting out to do what we do best — Stream Detroit! We took notes, we took pictures, we talked to people, we jumped on Twitter, quoted every speaker and we talked to everyone we could get in front of and now we’re ready; TEDxDetroit has inspired us to spread their ideas — to say the least, we’re now on a mission. Thanks to the team that made TEDxDetroit possible! As always, at Stream Detroit we believe that actions speak louder than words. TEDxDetroit has inspired us to hold up our end of the bargain; discover, explore, experience, record, spread and share. What are you going to do?